Sympathy cards can be difficult emotionally to make. I try to remember that the receiver will be touched when they receive it because it show that the sender cares. This is a closeup of the paper piercing and the embossing. I like the accent of the paper piercing on this card along with the embossing on the red piece. June 27, 2012 Due to an unexpected cost increase from our supplier, the cost for the 2-Way Glue Pen will increase from $3.50 as listed in the current annual catalog to $4.50. This price increase will be applied starting June 27, 2012. June 27, 2012 We have been working on the Stampin' Trimmer (item 126889) for a long time and are excited for this new cutting tool, exclusive to Stampin' Up! We don't have any new information yet, but we are working with the supplier to solidify the arrival date and a date that we will begin taking orders for you and your customers. It is on its way. We will keep you informed of the progress for delivery and let you know as soon as the trimmer arrives. I have found My Digital Studio to be fairly easy to use. This card just took me a few minutes. I will print it out on photo paper, then attach it to a card base. Yesterday, I told you about a new stamp set that will be offered in July 2012 ONLY thru a special promotion by Stampin' Up! called Reason to Smile. You can read more about it HERE. The card above uses two of the stamps in this new set (flower with stem shadow, and flower with stem outline). It uses a two-step stamping technique where you stamp the shadow first in a lighter color, then stamp the outline in a darker color. I have a two-step technique tutorial HERE. I thought the little frog springing up added a touch of whimsy to the card. All of the photos can be made larger by clicking on them. If you click on this photo, you will see the paper piercing that was done around the white design. This is one of the three sheets in the Essentials Paper-Piercing Pack sold by Stampin' Up! It has 3 unique templates that are each 6" x 6". The sheets/designs coordinate with punches on Pg 182-185, Edgelits on Pg 190, and Framelits on Pg 191 of the main catalog. I lined up the outline of the white cutout with the paper-piercing sheet and then using the paper-piercing tool pierced the dots around the inside edge of the red card stock. *Stamp-a-ma-jig is a must have item for any stamper. It will help you position the stamp image exactly where you want it. Invaluable with two-step stamping techniques. Miche just announced these two shells as the July Releases. Love them!!! 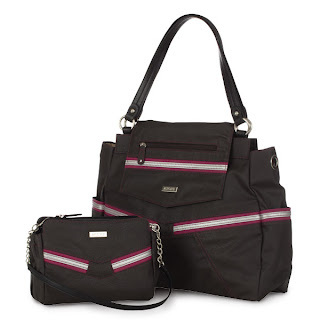 Hope you will stop by my Miche Blog to read more about them too. First, I want to share with you a few cards I made this weekend. The animals are NOT Stampin' Up!, but are from a foam kit I found at the store. Each animal had to be assembled. 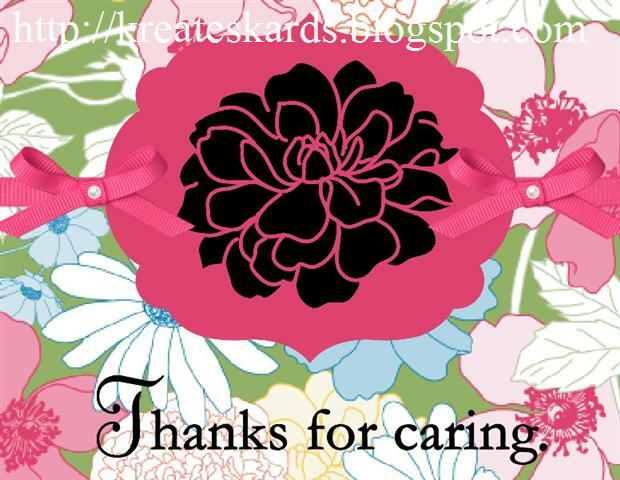 I created background images with Stampin' Up! stamps and classic inks. Then I attached these background sheets to card bases made with Stampin' Up! card stock. These cards plus envelopes will be included in a box we are sending to our military unit in Afghanistan. We leave the cards blank inside so that they have room to write a note to their family or friend. Cards for Soldiers Overseas is a big priority. I have 3 wonderful friends (Joan, Maureen, and Diane) who help me make cards almost every single week throughout the year. Click here to view pdf file about this promotion. You will be prompted to enter the $5 Item Number for a qualifying purchase. There are plenty of reasons to smile in July with the Reason to Smile set - only $5 when you spend $50 (before tax & shipping). This exclusive stamp set is only available during this special offer! It will be available in both wood and clear mount. I will have samples using this stamp set to share with you this week. Next week I will show you how to do paper piercing like this, plus give you more samples too. 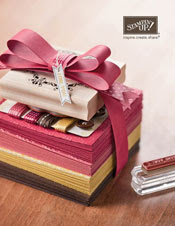 It is so easy to do and adds the WOW factor to your cards and scrapbooks. I was excited to realize that the Oval Accent Bigz Clear Die worked extremely well with one of the templates on the Essentials Paper-Piercing Pack. This template was actually meant to be used with the Apothecary Accents Framelits set. First I would like to share with you some additional photos of cards I created using the layered stamping technique. The video tutorial will be towards the end of this blog post. When I did the layered stamping, I stamped a light background design using Crumb Cake Classic Ink #126975 on all of the white card stock (shown in the video) with the exception of this last card which was done using Bashful Blue Classic Ink. The predominant image can be any stamp or color. You just want it to be something that will "POP". I've been having so much fun creating cards the last few days and even a few videos to share with all of you the next couple of days. 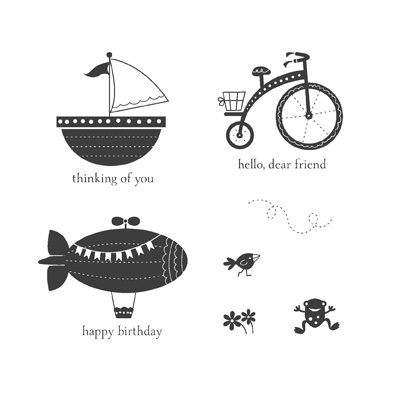 One of my favorite new products from Stampin' Up! are the Framelits that are used in the Big Shot. Tomorrow's video will show you how to cut them out using the Big Shot. Daydream Medallions Stamp Set - Stampin' Up! Stampin' Up! 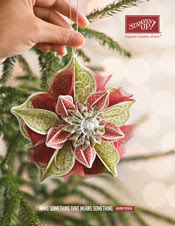 has so many wonderful coordinating stamps sets and paper punches/Big Shot products. It's hard to pick a favorite. Earlier this month, I showed you some of the Floral Frames Framelits that I had cut out. I have the stamp set that goes with them, and can't wait to try it out. Five layering dies (largest: 5 1/4" wide). Coordinates with Daydream Medallions Stamp Set on page 117 of the catalog. These combined will make beautiful layered embellishments for a card or scrapbook page. Wouldn't they make wonderful layered flowers too. Since I have both of these sets, you can be sure I will be posting samples on my blog of them very soon. As most of you are aware, I absolutely LOVE paper punches and Big Shot Dies. When I saw the new Elegant Butterfly Paper Punch, I knew it was a must have item for my collection. I just realized this weekend that there is a matching stamp set to use with it which is called "Papillon Potpourri". 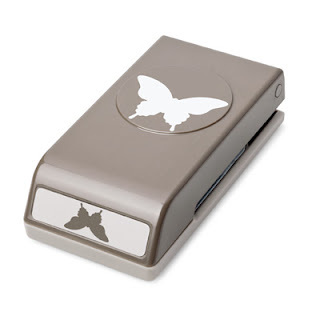 Elegant Butterfly Paper Punch, item #127526. Butterfly is approximately 1 5/8" wide by 1" high. 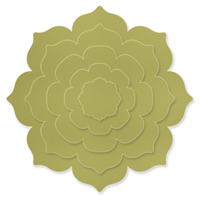 It is beautiful punched out on solid color card stock or with our Designer Series Paper. This stamp set coordinates with the paper punch. Oh my gosh, this is on my "NEED" list now. 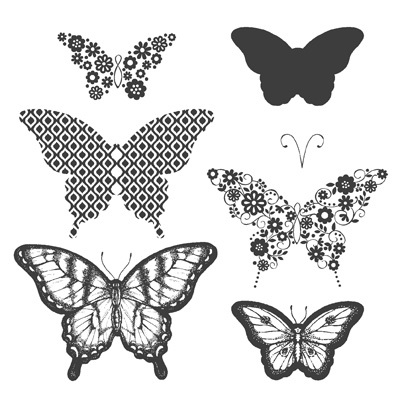 Think of all of the colors of ink I could use along with different colors of cards stock to create some truly amazing butterflies. Here is my final card this week showcasing the Ronald McDonald House Charities Stamp Set called Moving Up. It is item #126320 in Wood OR #126322 in Clear. My first photo is of the new card. Second photo is the 4 cards I made using this stamp set. Third photo is the stamp set package. The little birds, flowers, and frog are so cute. Hope you will try this stamp set soon. I hope you don't mind, but today I am testing out a new video camcorder. 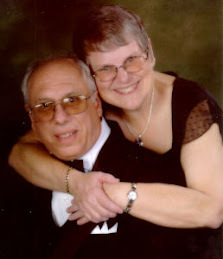 I will post a couple of photos of the card and then do a short video of the cards and stamp set that I used this week. Remember if you are reading this via e-mail, you need to come to my blog to view the video. The latest My Digital Studio (MDS) downloads are HERE. Here's a card I made this morning using some of the new digital designs. Here's my 2nd card using the Moving Forward stamp set. Here's a close-up of the card base. I think this embossing folder (Fancy Fan Folder) looks a little bit like waves. It could be used for clouds too. Ronald McDonald House Charities help support families with children who have serious illnesses. Together, we have contributed over $1,000,000 to RMHC. You can help us make a difference. Purchase this year's set, Moving Forward, and we'll donate $3 to Ronald McDonald House Charities for each set purchased. Here's my first card using this stamp set: Moving Forward. Here's a close-up showing the embossing, sponging, and brad accents. Isn't this set "Moving Forward" great!!! This week I'm going to showcase it and show you some of my creations. "See what you're cutting with Framelits dies. Use with the Big Shot, Standard Cutting Pads, and the Multipurpose Platform. 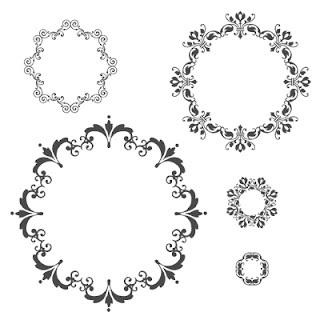 Floral Frames Framelit Dies coordinate with the Daydream Medallions Stamp Set. 5 layering dies (largest: 5-1/4" wide). Cuts a single sheet of paper." Thought it might look cute to stamp an image and then place the flower frame around it. Will have to play with it this weekend. Looking forward to showing you some of my new projects next week. My Package of New Stampin' Up! Products Arrived!!!! Oh happy day!!!!!!! The UPS man delivered my package from Stampin' Up! yesterday, it even arrived hours earlier than normal. He must of known just how excited I was to received this package. I've been so busy playing with the new products that I didn't make a card or project. Know you will understand as long as I share some photos of some of the new things. Argyle Folder ... new larger size: 4 1/4" x 6 3/8"
Fancy Fan Folder ... new larger size: 4 1/4" x 6 3/8"
Chevron Folder ... new larger size: 4 1/4" x 6 3/8"
I really like the "outdoor" themed set. It has a tent, chair, fire, lantern and more. It is called the Great Outdoors Stamp Brush Set, item #130857. June 5, 2012 Due to unforeseen legal issues, we have turned off the item numbers in OEX for the Carry On Hostess Stamp Set (126645, 126647, and 128156). 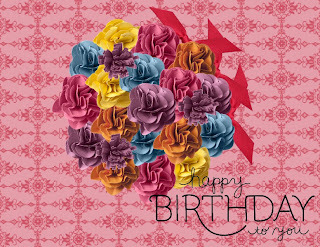 I punched out the Blossom Flower Punch twice and layered it on this card. Perfect for most occasions. *Colors in Summer Smooches are Daffodil Yellow, Lucky Limeade, Rich Razzleberry, Tempting Turquoise, Island Indigo, Real Red, Tangerine Tango, and Whisper White. Details: During June, new demonstrators not only get to choose the products for their fully customizable Starter Kit, they'll also get products from the brand-new Patio Party Suite for FREE, including the Make a Cake Set, Patio Party Designer Series Paper, and the Patio Party Digital Collection DVD! 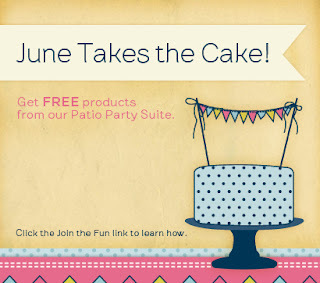 That's up to $48 in additional FREE products! CLICK HERE to see the flyer and photos of the products. Details: During June and July, hostesses who hold a minimum $450 workshop will receive an additional $50 in hostess FREE merchandise dollars--that's in addition to the $65 they already receive for a $450 workshop! This promotion is not valid for on-line orders. If you have an order that is a minimum of $450 before tax and shipping, contact me directly and I will place the order for you so that you receive the additional benefits.